Yachting Championship in St. Petersburg. St. Petersburg's championship of cruising yachts, organized by the city's sport committee and Sailing Union, was held last weekend. 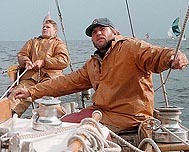 There were six test groups where yachts “Interpoler”. “White Night”, “Nika”, “Gina”, “Moderna” and “Prometheus” won. City news archive for 18 September' 2001.